Scientists have developed a reconfigurable quantum photonic chip, control electronics, and optical fibers which send photons into and out of the chip. This is a big step towards the development of the quantum computer. Scientists and engineers are looking at quantum computers as the next replacement to digital and silicon based computing. Basically, it's the next evolution in computing. Scientists are looking at entanglement as the basic resource in connecting and transmitting information from one atom to the other. Entanglement is the connection between two particles. Basically, when two particles interact physically and are separated, the pair still are able to interact with each other regardless of distance. Einstein famously called this property 'spooky action at a distance'. Video: What is Quantum Entanglement? Researchers at Bristol University have recreated this on a tiny silicon chip. The chip can generate, manipulate and measure this phenomenon. They have also used the same chip to measure mixture—an often unwanted effect from the environment, but a phenomenon which can now be controlled and used to characterize quantum circuits, as well as being of fundamental interest to physicists. "In order to build a quantum computer, we not only need to be able to control complex phenomena such as entanglement and mixture, but we need to be able to do this on a chip, so that we can scalably and practically duplicate many such miniature circuits—in much the same way as the modern computers we have today," says Professor Jeremy O'Brien, Director of the Centre for Quantum Photonics. "Our device enables this and we believe it is a major step forward towards optical quantum computing." The 70mm by 3mm chip (the black rectangle in center of image) consists of a network of tiny channels which guide, manipulate and interact single photons—particles of light. These photons acts as the qubits for the quantum computer. 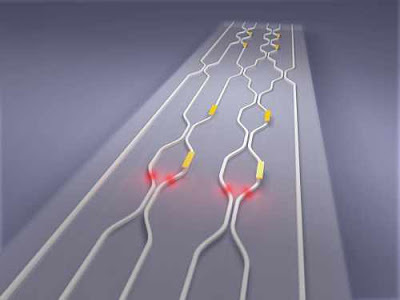 Using eight reconfigurable electrodes embedded in the circuit, photon pairs can be manipulated and entangled, producing any possible entangled state of two photons or any mixed state of one photon. "It isn't ideal if your quantum computer can only perform a single specific task", explains Peter Shadbolt, lead author of the study, which is published in the journal Nature Photonics. "We would prefer to have a reconfigurable device which can perform a broad variety of tasks, much like our desktop PCs today—this reconfigurable ability is what we have now demonstrated. This device is approximately ten times more complex than previous experiments using this technology. It's exciting because we can perform many different experiments in a very straightforward way, using a single reconfigurable chip." The researchers, who have been developing quantum photonic chips for the past six years, are now working on scaling up the complexity of this device, and see this technology as the building block for the quantum computers of the future. Dr Terry Rudolph from Imperial College in London, UK, believes this work is a significant advance. He said: "Being able to generate, manipulate and measure entanglement on a chip is an awesome achievement. Not only is it a key step towards the many quantum technologies— such as optical quantum computing—which are going to revolutionize our lives, it gives us much more opportunity to explore and play with some of the very weird quantum phenomena we still struggle to wrap our minds around. They have made it so easy to dial up in seconds an experiment that used to take us months, that I'm wondering if even I can run my own experiment now!"